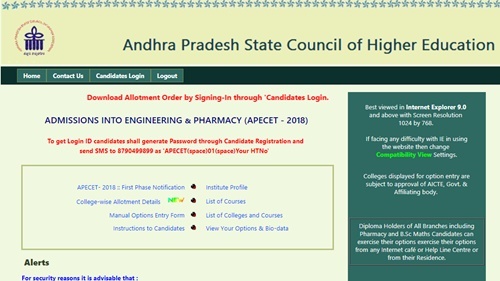 AP ECET Seat Allotment 2018 Results: Andhra Pradesh ECET 1st Phase 1 Counselling Seat Allotment Results Announced today, candidates can download ECET Allotment Order at apecet.nic.in and mentioned direct links below. A Common Entrance Test designated in full as Andhra Pradesh Engineering Common Entrance Test for Diploma Holders and for B.Sc. (Mathematics) Degree Holders and in short as AP ECET 2018 conducted by JNT University Anantapur on behalf of the Andhra Pradesh State Council of Higher Education for the academic year 2018-2019. The admission for the ECET seat allotment is conducted in two phases. Based on the ranks acquired by the students, this first half will be eligible for the first phase of counseling and the remaining half are eligible for the 2nd phase of counseling. The Students who have submitted their web options can download the AP ECET 2018 Seat Allotment Order through online. How to download the AP ECET 2018 Allotment order from online? 4) Now Open the ECET 2018 Seat allotment Order to Check allotted College of Student with Details of Payable Fee Details. 5) Now take Printout the both of Seat allotment Order and challan Slip to pay the fees. 6) The fee payable at any Branch of Andhra Bank/Indian Bank. The Students Can Report in your allotted College with allotment Order in before final Date with Seat allotment Order and Paid Fee Bank challan Copy. In case if you have not Report in before the final Date your allotted Seat automatically Cancelled or if you are not interested to join in the institute which you got, you can attend for 2nd Counseling. The AP ECET Provisional Seat allotment starts from 14.7.2017 after 06.00 PM for phase-1. 1.2 How to download the AP ECET 2018 Allotment order from online? Sir I lost my allotment order. How can I get it now? ?